Cosí Fan Tutte, the basis for A Little Too Cozy, is one of Mozart’s best-loved operas: a gay romp filled with questionable alliances, twisted gags, and bizarre psychological games. If this formula sounds familiar, it should. 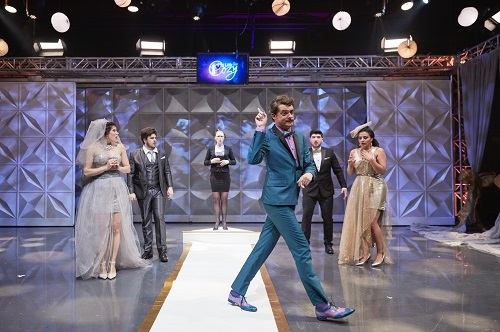 Against the Grain Theatre, under the artist direction of Joel Ivany, astutely recognized that this is the formula of every reality TV show since the turn of the millennium. The venue for this innovative production, based on a time-honoured classic, was studio 42 in the CBC building. We were the live studio audience. In this translated adaptation (Ivany calls this a transladaptation), our couples are the final contestants on a matchmaking TV show. Elmo (traditionally Guglielmo), Felicity (Fiordiligi), Fernando (Ferrando) and Dora (Dorabella) have courted each other throughout the show’s season, but have never seen each other face to face. On the eve of their wedding, the show’s host, Don. L. Fonso (Don Alfonso), and talent relations manager, Despina, decide to subject the couples to one last test. The men are instructed to seduce the women as total strangers. If they fail, and their women prove faithful, the marriages will proceed – and they’ll get a bunch of cash. If the women stray, however, everyone goes home empty handed. The production is in English, with lots of modern idioms and profanity. The recitative that is usually part of this opera is evaporated into spoken dialog, at times creating the illusion of musical theatre sampling opera. Despite this modern spin, the story, and more importantly its key themes, are largely unchanged. Truth be told, I was surprised by just how little needed to change to turn this tale into a reality TV melodrama. It makes sense: opera had melodrama all figured out long before Survivor was a gleam in anyone’s eye. Most importantly, all of Mozart’s stunningly lyrical and captivating arias, duets, and ensembles are present. The highly effective arrangement of the score for string quartet and piano was at times juxtaposed with punchy prime-time TV show theme music. Audience members were invited to tweet their votes for #teamdora, or #teamfeliciy. The performers, amidst stunning singing, responded to tweets in real time. The video segments interviewing the shows contestants, which appeared on TV screens on either side of the stage, were truly hilarious, and one of the highlights of this production. The show shoots in Toronto, which provided an excellent opportunity for some on-the-nose local humour. I must confess, I HAD been drinking red wine before heading to the show. The insertion of the video segments, along with the transformation of the traditional recitative into spoken dialog, placed significant dramatic demands on a cast comprised of singers first and foremost. The cast demonstrated true professionalism and acquitted themselves impressively as actors. This transladaptation’s leads are rising talent to watch out for. Shantelle Pryzbylo’s performance of Per pieta, ben mio perdona was supple, warm, and even during the highs and lows of lyrical passages, while bringing a bold edge and spin to the coloratura passages. Her duets with Rihab Chaieb were glorious and sensual, and cultivated a convincing gal-pal relationship. Ms. Chaieb hearty, thick-like-molasses low notes during Smanie implacabili, united with her confident and sensual stage presence, animated the role of earthy, passionate modern-day Dorabella. Ivany’s ability to bend the original libretto like a spoon from The Matrix while still maintaining the story and sentiments of the original opera demonstrated true creative brilliance. Despite high fidelity to the original opera, A Little Too Cozy is truly a new entity. The opera workshopped at Banff centre for the performing arts last year, and is on its way to being an important part of Cosí’s performance history. That being said, there a still a few kinks to work out. The blocking looked disorganized in some spots, and led to a few awkward moments where a non-singing performer was obscuring a singing performer from view. When this was echoed on a TV screen on either side of the set, it was quite distracting. Also, given the extent to which this libretto is a reimagining of the original, a synopsis in the program might have been helpful. My companion and I really did not get what happened with the sushi, as some of the unfamiliar dialog was lost. Nevertheless, this production is a must see. It is a fresh, innovative, funny, and visceral characterization of love in the technological age.